How are you all going at the moment, organised for Christmas? starting to panic a bit? It is all systems go here, I've spent today shopping and have broken the back of my list, and I've ordered the pork for lunch. We got through our busy weekend, and had a lovely social time in the process and now the end is is sight!! So I hope you all have a wonderful time this Christmas with family and friends, good food and laughter, and generally just a lovely merry time!! And I hope there are no fights, I know this stressful time of year can push relationships, so let's just relax and be nice to each other and let go of the little things! I probably won't get to post again till after Christmas, the boys finish school in a couple of days and will be dominating computer time, so have a great day!! PS I am really enjoying my advent swap pressies, I have been very spoilt, so Vickie thank you so much! Slack me though, haven't taken any pictures, will try and do a big group shot at the end. The polka dots are amazing. I love them. Snap! I think we crossed paths in the air somewhere. How cute is your cushion. 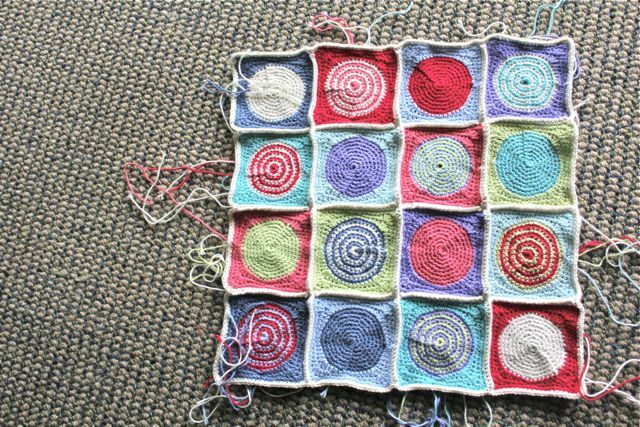 Now I've finished my blanket I am so tempted to make some mini squares into a cushion. I love the idea of the singles instead of doubles. Hey Jules, your cushion is looking fantastic. Enjoy the festivities and hols. It's been a fun year reading your blog posts and seeing all your makes. Happy Holiday!!! 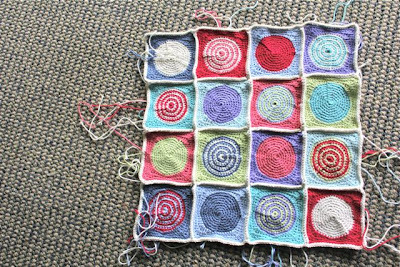 Lovely cushion in progress. Have a wonderful Christmas ..... love the crochet ... it looks awesome. Ooooooooooooooh! Loving your polka dot cushion, amazing! Have a lovely Christmas and thank you for all the inspiration! I'm back and forth between panic, giving up, and calm acceptance in terms of my holiday gift progress! The polka dots look great. Happy holidays. Love your polka dots. Your cushion is an eyecatcher!